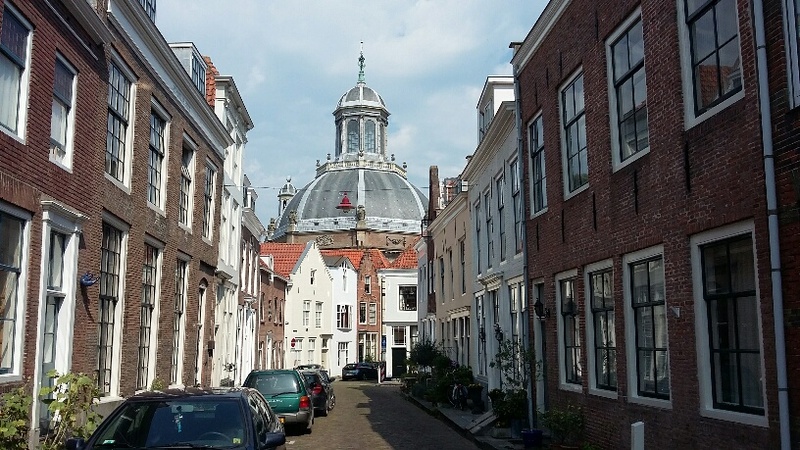 Middelburg doesn't sound inspiring, rather bland and middling really. Yet it's quite spectacular in a quiet way. This was our second day exploring and it was twenty times more enjoyable at a civilised temperature of 22°C rather than boiling 30+ yesterday. 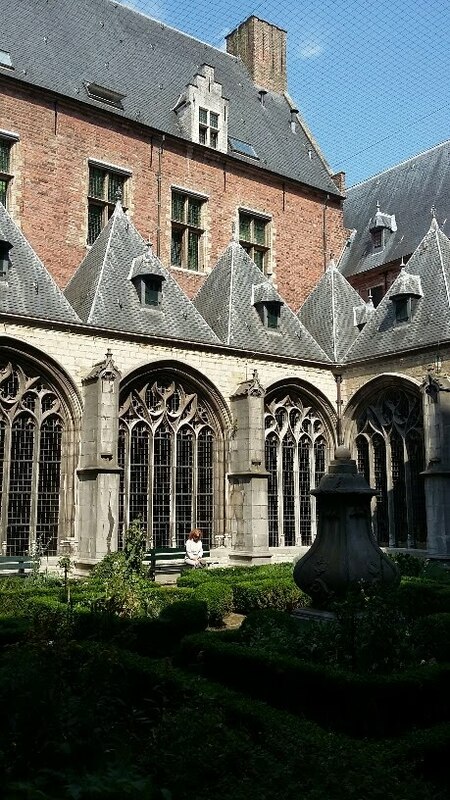 It was an important trading town (slaves as well as spices) in the days of the Dutch East India Company and the affluence can be seen in the splendid abbey, town hall and many towering, elegant mansions. In 1940 a chunk of the old town was bombed and destroyed by fire, and there's been a lot of careful restoration. 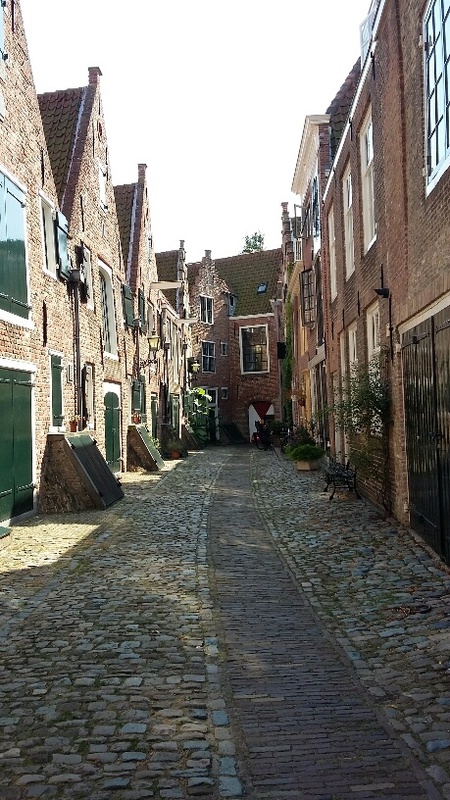 Fewer houses lean drunkenly here than in other Dutch towns. There's some dull modern bits but in large part it's all very handsome. Lots of glossy dark green painted windows and front doors, with the owner's name in flowing white script above the door knocker. We wanted to visit the old abbey, now a centre of local government and the Roosevelt university. Sadly there is some enormous music festival starting tonight in the abbey square, and much of it is out of bounds. 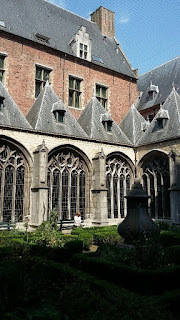 However we sneaked into the old cloisters of the Norbertine monks and sat in the fragrant herb garden at the centre (pictured) A Zen moment. 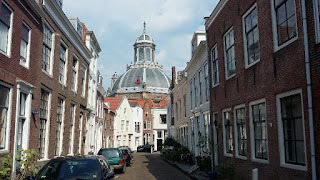 Earlier we nipped into the Oost Kerk, also pictured, a Protestant church with a huge Catholic style dome and much ornamentation. A very friendly woman told us about the Roosevelt connection. Apparently the antecedents of FDR came from Middelburg and that's why the university was set up here in 2004. Also they award a Four Freedoms prize - freedom of speech, worship, freedom from want and from fear. Nelson Mandela and Desmond Tutu are past recipients. 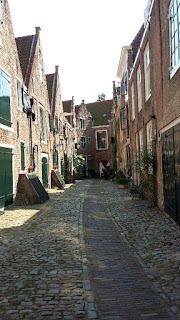 Then we took a look at the Kuiperstraat, (pictured) a small and exquisite street of little houses which date back to the 16th century. One had an open stable door - you could imagine a Vermeer woman in a cap pouring milk in a shady corner. 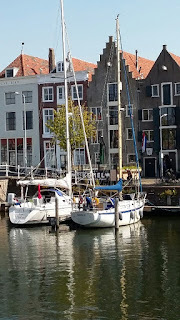 Now we are back at the boat (see her pictured in her berth) for a spot of tea and Nic has again rigged a temporary awning over the cockpit to allow us to sit in comfort. 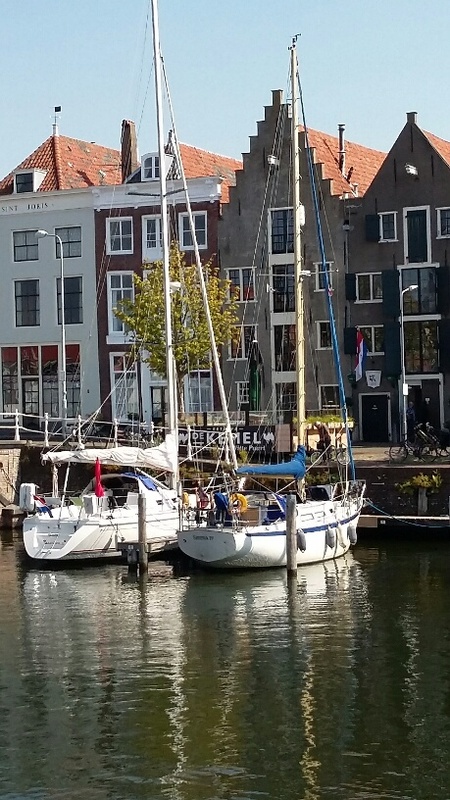 Tomorrow we plan to leave for Breskens on the coast, so this may be our last night on the canals before we finally burst out into open salty sea.